There are reefs in the Great Lakes? That was my first thought when I sat down to interview for a field technician position in the fall of 2014. I had been working at a tech job at Purdue University, but I felt that it was time for a change–to something that was a bit more interesting to me. When I had the chance to interview to be a field tech on a fish ecology project, I knew that the time for change had arrived. But working on reefs? Coral, colorful, vibrant reefs teeming with a spectacular array of exotic fish species? I asked the post-doctoral fellow conducting my interview, Dr. Mitchell Zischke, if those were the kind of reefs he was talking about. “Not quite,” said Mitch. “Reefs in the Great Lakes are rocky, made of cobble, gravel, and other stony fragments.” Ah. That’s very different than the vision most people get when they think of underwater reefs. A lot of publicity is directed towards oceanic coral reefs and their current plight worldwide, and rightly so. But I think sometimes that comes at the expense of exposure to unique and threatened environments much closer to home. The reef systems of the Great Lakes are a prime example. I say this based on my own experiences as a native of the Great Lakes region. I grew up in a small town in western Michigan, right on the shores of Lake Michigan. My family often traveled around the state, spending time at all of the Great Lakes. Yet I never heard mention of any rocky reefs. I’d wager that outside of die-hard fishermen, most citizens of the region haven’t been exposed to our local reefs, either. Going forward, I’m hopeful that a lot of exciting research on the Great Lakes is about to change that fact. That’s how my current project fits into all of this. It turns out that I liked being a fisheries ecology technician enough that it led directly into graduate school at Purdue University. I am now a Master’s student under the guidance of Dr. Tomas Höök, associate professor at Purdue and associate director of research for Illinois-Indiana Sea Grant. Along with many other organizational partners (including Michigan Sea Grant, Michigan Department of Natural Resources, Michigan Department of Environmental Quality, U.S. Fish and Wildlife Service, and the United States Geological Survey, to name a few) we are in the beginning stages of potential rocky reef restoration in Saginaw Bay in Lake Huron. To understand why reef restoration in Saginaw Bay is a good idea, a little historical background is important. Years ago, Saginaw Bay was the second largest walleye fishery in all the Great Lakes, and had a healthy population of fish spawning on rocky reefs in the bay. These reefs provided many benefits to incubating eggs, including excellent protection from predators. Long-term sedimentation and poor land use led to most of those reefs being lost. This had profound negative impacts on walleye, as well as on other recreationally- and commercially-important fish species. 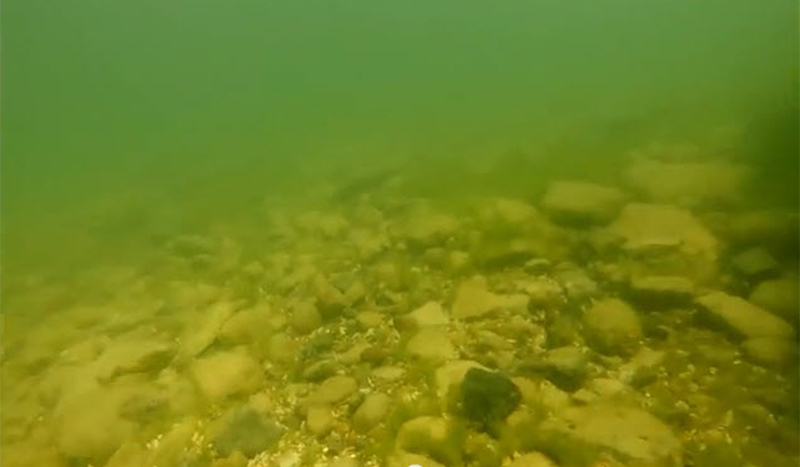 Today, the walleye population has recovered, but the fish spawns almost completely in tributary rivers that feed into Saginaw Bay, rather than the bay itself. Reef restoration would allow walleye to have prime spawning habitat in the bay once more, and hopefully encourage these fish to resume using some of their historic spawning grounds. Beyond the obvious benefits to an increased amount of spawning area, this would also pave the way for a more geographically- and genetically-diverse walleye population. Such diversity could prove very important during times of stress. 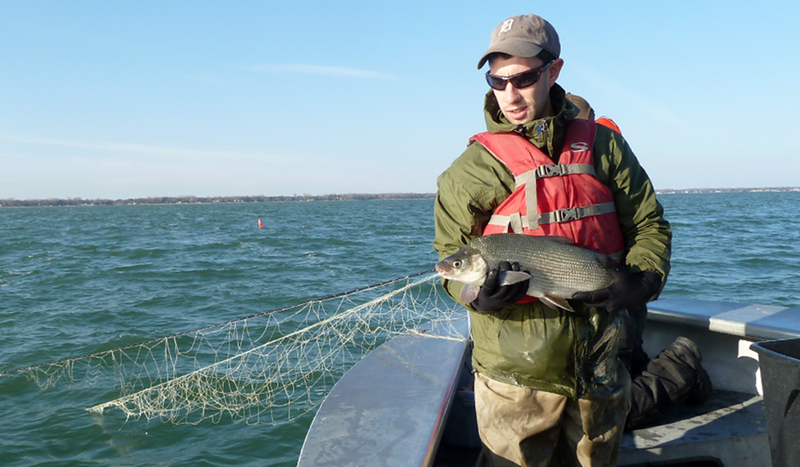 Of course, many other fish species, such as lake whitefish, would also be able to use restored reefs. However, before rocky reef habitat could be restored in Saginaw Bay, we needed to make sure that restoration would have a good chance of being successful. Restoration projects are never cheap, and we wanted to be sure that funding was being wisely spent. That’s where my specific project comes in. 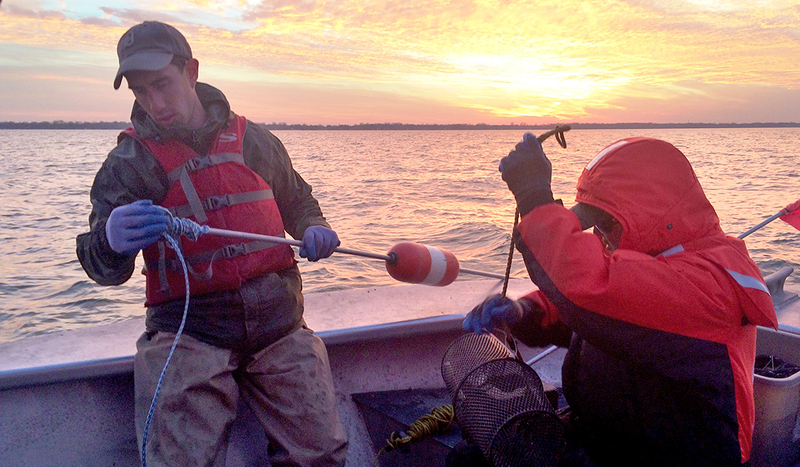 A small field crew, comprising members of Purdue University (including me, Dr. Zischke, and Jay Beugly, who also serves as an aquatic ecology specialist for Illinois-Indiana Sea Grant) and the USGS, was tasked with assessing current spawning patterns within Saginaw Bay. Essentially, we wanted to see what currently degraded reef sites looked like, whether key species like walleye and lake whitefish were spawning near those degraded sites, whether they were depositing eggs, and whether predators were around to eat those eggs. If we could say that water quality was decent, target species were spawning in the area and depositing eggs, and that egg predators weren’t too abundant, we might have a reasonable shot at successful reef restoration. We’ve been at it since late 2014, and though results are still preliminary, there are some positive signs. Water quality is good, and some sites look receptive to adding additional reef structure. Spawning walleye and lake whitefish are being found across the bay, and they’re depositing eggs, too. Numbers of fish and eggs are low, but the fact that fish exist to take advantage of potentially restored reefs is hugely important. 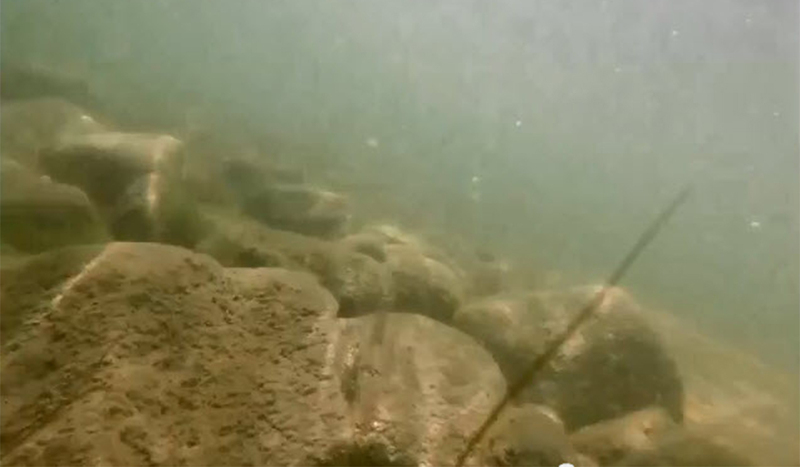 We’ve also found that egg predators are present, but that the biggest predation risk is probably from large-bodied fish like common carp and catfish. Given these findings, we are optimistic that rocky reef restoration can be successful in Saginaw Bay. Hopefully, restored reefs will attract higher numbers of fish to spawn, while simultaneously providing cracks and crevices to help eggs avoid large egg predators. If everything goes right, reef restoration in Saginaw Bay could be going on long after I’ve left Purdue. Really, I think that’s one of the coolest things about this project: It has so much potential. With many groups involved, like Sea Grant, and tons of habitat to restore, reef restoration could be the definition of a long-term undertaking. Who knows, maybe I’ll find myself back on the familiar shores of Saginaw Bay one day, working once more on a project that helped launch what I hope will be a long career in fisheries science. For now, I’m just focused on the upcoming field season. It’s the last chunk of field work in our spawning assessment. If we keep finding some of the same patterns, I’m very excited for the future of reef restoration in Saginaw Bay and across the Great Lakes.